App: Also known as “Application,” or software that has been developed for specific purposes. If you are speaking about this term broadly, as in, “I just bought a new navigation app for my iPhone,” it should be lowercase. If you are referencing, “I can’t find anything interesting in the Mac App Store,” it is a proper noun and should be capitalized. Blog: This is a website that is typically run by an individual, a company or even a group of individuals where the information is presented in reverse chronological order, with the most recent post or information presented first. A blog is the website platform itself, a blog post is an individual entry. Check in: A “check in” can be a verb, a noun or an adjective. This is most commonly referenced when someone “checks in” on Facebook or Foursquare. Content Curation: This is the act of managing, selecting, presenting and discussing information that is specifically found for use on social media. It is a form of content marketing where an individual does not necessarily create their own original content, but instead markets the material produced by others to provide information or data to their existing fan base or following. E-Book: A book that has specifically been formatted for use and production on an e-reader, such as an Amazon Kindle, a Barnes & Noble Nook and the like. This is usually presented in the form of “e-book” or “e-reader” when discussing the platform as a whole. 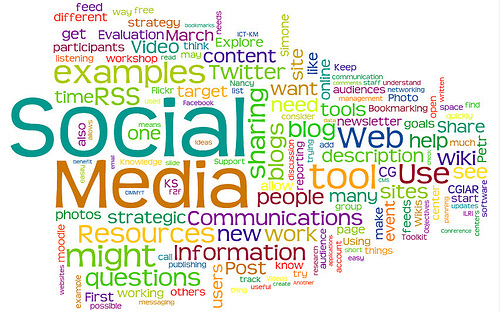 Friend, Follow and Like: These words, as they relate to the world of social media, are acceptable as nouns and verbs. The words refer specifically to actions and relationships on Facebook and Twitter. “Friending” and “liking” refers to Facebook interactions and “following” happens on Twitter. In part two of this post, we will go deeper into the social media and Internet-related terms that have become forefront in our vocabulary in recent years. Feel free to use this information as a guide and be a part of standardizing the usage of this Internet-related language.